Joy2Endure Recognized as One of Top 30 Blogs by Health Unlocked. The months of July- August were busy ones for Joy2Endure. This was because we honoured the call to participate in the just ended Health Unlocked Health Bloggers Award 2017 organized by Health Unlocked, an online community which amongst others, recognises and promotes good health and those who blog about health issues where people can gain insights on how to manage or live with a certain health condition. Going in for the Category of Health Blogger of the Year was abit daunting because not only was it the main prize of the award, it was a highly competitive field. Nevertheless, I saw my blog met the criteria and I was like why not give it a try?The try led to my getting the nomination and now the real battle of the crown began. My amazing team was relentless in their pursue of this crown for me and we put in our humanly best… alas, only one person could win. I was a bit sad, because I wanted to win. I saw it as a way to turn the focus on Sickle Cell Disorder and all those suffering and dying from it daily most often because of ignorance, misconceptions and lack of attention on Sickle Cell. That notwithstanding, I realized that, though I didn’t get the crown, it was not all in vain either. The was much attention and sickle cell awareness during the campaign months for this award that I will always be grateful for the opportunity. It was a big moral boost for someone whose main focus for blogging was to debunk myths and misconceptions and hopefully, educate others about living with sickle cell from my own personal experience. The overwhelming support I received during this period showed that, slowly but surely, that goal is being achieved. 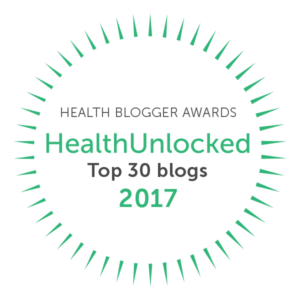 It is not a small thing oh for a novice with just personal experience to be listed amongst top 30 health bloggers of the year. Yes, I didn’t win but by coming this far, I still won. My heartfelt gratitude to Health Unlocked and to all the amazing cheerleaders who brought me this far. We press on in our battle to educate, debunk myths and break the silence around sickle cell. Keep Reading, Keep Sharing & Commenting . We are inspired by your comments. Prev Debunking Myths 5: Sickle Cell Warriors Cannot Raise Families. Next FEATURED: Sally Mboumien, A Trailblazer in Sexual and Reproductive Rights Education in Cameroon.